Mugsy's Rap Sheet » Critics Say Trump Jr Investigation is Evidence of a “Witch Hunt”. Nope, Same Hunt. I upset a number of readers back in 2014 when I argued that “Snowden is no hero“. Unlike GENUINE whistle-blowers who have my utmost respect, Edward Snowden didn’t see a wrong and attempt to right it, he sought out a job that would give him access to classified info, then stole that info en mas without having any idea if what he was stealing contained anything of social import, fled the country into the open arms of a nation hostile to the U.S., THEN read through everything he stole and decided ON HIS OWN what we deserved to know and what we didn’t. He even blackmailed the U.S. government by threatening to release even more classified documents if they came after him (so we don’t deserve to know what’s in a document unless he’s threatened?) Nothing Snowden did qualifies him as a “whistle-blower” or “hero” worthy of praise in my book. Someone who agreed with me at the time was American reporter (working for The UK Guardian) Glenn Greenwald who was also a Bernie Sanders supporter like myself. Greenwald criticized Snowden’s actions when the story broke, but quickly changed his tune when Snowden picked HIM to be his inside man to tell his story. I’ve been critical of Greenwald’s “ethics for sale” ever since. So it came as little surprise to me over the weekend when I heard Greenwald taking the side of critics of the Democrat’s investigation into Donald Jr.’s meeting with a Russian lawyer back in June 2016, questioning if investigating Junior has anything to do with the original mission of “Whether or not the Russians [attempted to] hack our election?” To Greenwald, the investigation of Trump Jr has nothing to do with the original stated purpose of the investigation into alleged Russian hacking, and therefore does indeed make it appear to be a Democratic “witch hunt” just as Trump Jr. claims. 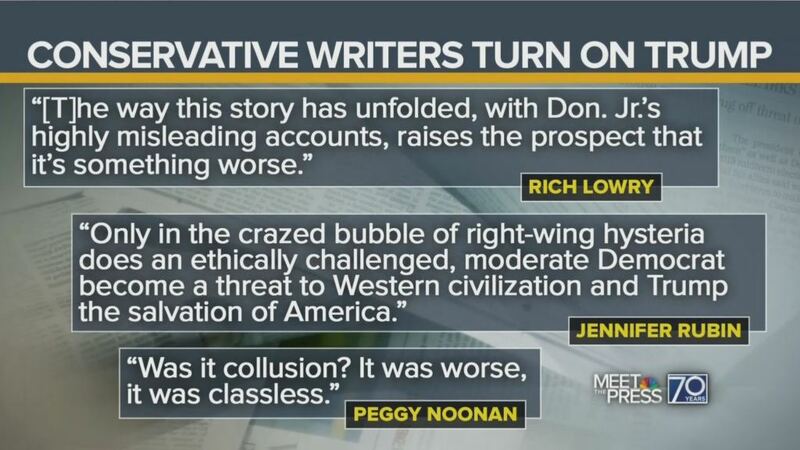 Which is really quite insane coming from Conservatives. I guess one must be over the age of 40 (Junior is 39) to remember the Clinton Presidency and the ceaseless parade of ever-changing investigations of Bill Clinton. The GOP demanded (and got) a Special Prosecutor named Ken Starr… originally hired to investigate whether or not then-Governor Bill Clinton was shown favoritism in a failed Arkansas real estate deal known as “Whitewater”. 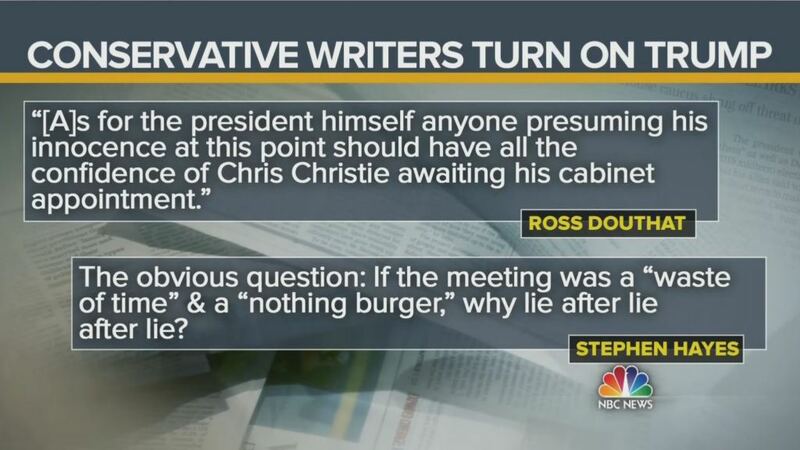 That SAME investigation morphed REPEATEDLY over time to include investigations of the White House Christmas card list (“were taxpayers footing the bill for all those stamps?”), the “Socks the Cat Fan Club” mailing list (ditto), “Trooper-gate“ (did then-Governor Clinton use local cops to shuttle girlfriends in & out of the Governors’ Mansion?) and eventually the Lewinski Scandal (with plenty of other investigations in between.) Was any of that related to “Whitewater” (their original stated purpose?) Of course not. Was any of that as great a threat to the very foundation of our democracy as the Russian Meddling investigation being conducted today? And now Conservatives think Democrats are on a “witch hunt”… or so says the man who questioned his predecessor’s place of birth for eight straight years to make the case he was not a legitimate president. 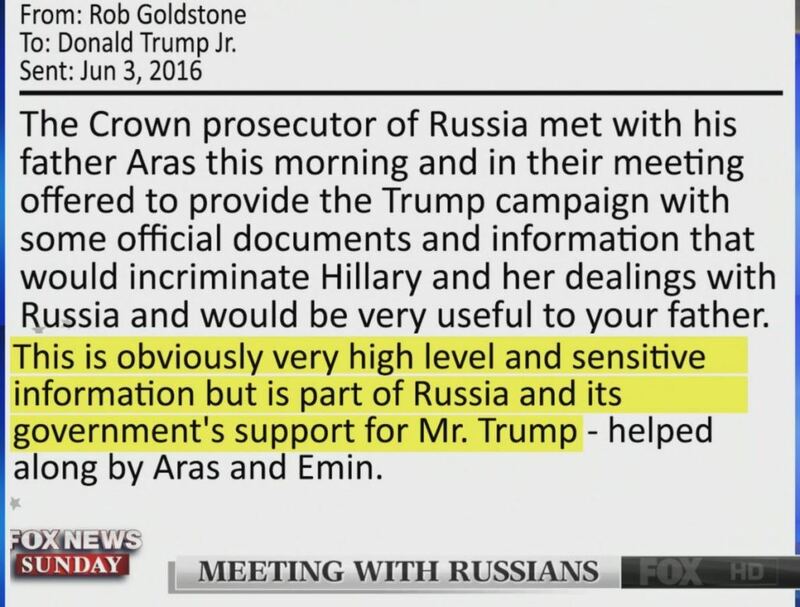 June 7, 2016, THE VERY NEXT DAY, Trump Jr responds to Goldstone’s email, asking him to set up the meeting with Russian lawyer Veselnitskya and that they could meet at Trump Tower in NYC. Don then emails his brother-in-law Jared Kushner and his fathers campaign manager Paul Manafort (who would later be forced to resign when it was revealed he had worked as a lobbyist on behalf of the Russian government) and invites them to join him in the meeting with the Russian lawyer promising dirt on Clinton provided by the Russian government. The inclusion of Manafort is a HUGE problem for the Trump campaign because Don Jr could rationalize that nether he nor Kushner (at the time) actually worked FOR the campaign and therefor what he told GMA (and everyone else) was not a “lie”, but Manafort’s presence destroys that defense. According to Don Jr, the stated purpose of the meeting was “to discuss Russian/American adoption”… which Putin had suspended in retaliation for the “Magnitsky Act”. Even if that were true, the only way the adoption embargo would end is if that Act (which made Putin quite angry) were repealed, so really, Veselnitskya’s goal was to seek the repeal of “The Magnitsky Act”, not concern over International adoption. But for Don Jr… who now claims the meeting was just about “adoption”… that was NOT why HE excitedly agreed to the meeting. 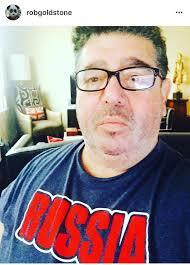 HIS focus was the promise of “dirt” on Hillary Clinton provided by the Russian government. June 9th, 2016, the meeting takes place in Trump Tower (one floor below his father’s office). It quickly becomes apparent to Kushner & Manafort that Veselnitskya had “nothing” and left after “10 minutes”. Don Jr also left the meeting after coming to the same conclusion after 20 minutes. Remember at the the time, accusations were flying that Russia was behind the hacking of the DNC and the stolen Podesta emails that had appeared on a Russian website.) Don Jr. was clearly expecting salacious information revealed in those emails. The fact they produced “nothing” highlights the fact there was nothing highly controversial in those stolen emails to begin with the way many continue to insist. 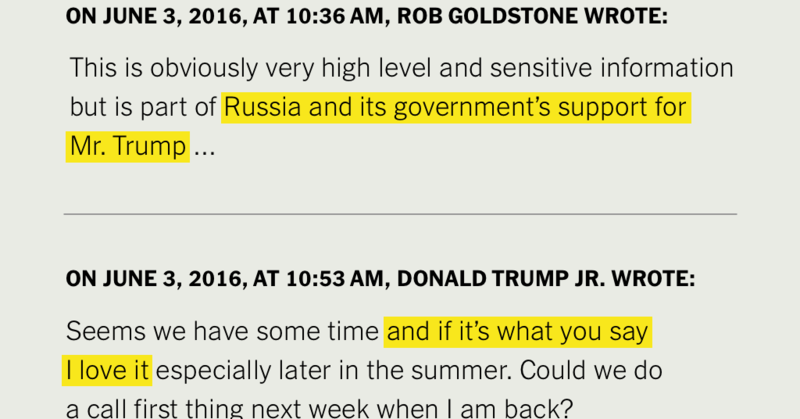 The investigation into the details of Donald Trump Jr.’s meeting with a Russian lawyer… and now we know (no thanks to him) that the meeting also included Goldstone, a Russian/American lobbyist named “Rinat Akhmetshin”, a translator, and a yet-to-be-identified Russian security officer… continues. Trump Sr. says his son just did “what anyone would have done in his situation” when offered “opposition research”. During the 2000 presidential campaign, just prior to the September debate, the Al Gore Campaign received a package in the mail containing stolen material from the Bush campaign. The Gore Campaign’s response was to call the FBI. Maybe “excitedly agreeing to meet with a hostile foreign power in hopes of obtaining stolen property you believe will benefit your campaign” is what “anyone with the last name of Trump” might do, but it is definitely not what “anyone” would have done in his position. And continuing to investigate Russian efforts to meddle in our (past and FUTURE) election(s), and the apparent willingness of people associated with the Trump campaign to support those efforts, is ENTIRELY the point of the Democratic investigation into Russian meddling. A single hack is barely a footnote in this investigation, and if all we did was restrict our focus into “who hacked the DNC”, we’d be ignoring the greatest threat to our democracy since the War of 1812.